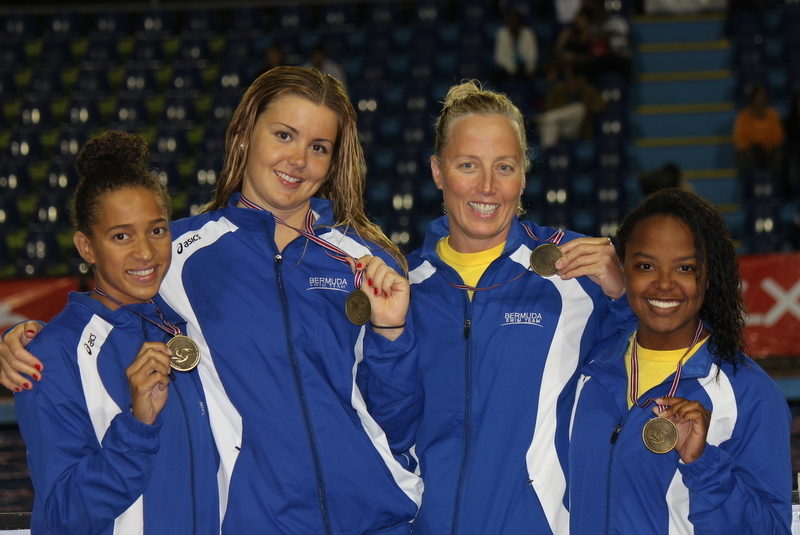 Bermuda swimmers have finished competing in the 2013 Central American & Caribbean Championships in Costa Rica, claiming 14 medals, including 6 golds, in the field of over 2,200 swimmers from some 19 nations. On the final day Bermuda picked up an additional four medals, with Jesse Washington claiming a silver and a bronze, Ashley Yearwood winning a silver medal, and the women’s 4×100 freestyle relay [Stephanie Myles, Rebecca Heyliger, Lisa Blackburn, Ashley Yearwood] claiming another gold medal. Bermuda’s top medalist was Lisa Blackburn, with the 42-year-old veteran capturing five medals — four of them gold — as well as being a part of both gold medal winning relay teams. Jesse Washington, Ashley Yearwood, Shannon Hassell, Stephanie Myles, and Rebecca Sharpe also added to Bermuda’s medal tally. National Swimming Coach Ben Smith said, “We are hoping that the results of this meet, along with the results of the recent Coral Springs Invitational, the Carifta Championships and indeed the last several years of results, will be noticed and will allow Bermuda Swimming to reach ‘National Sport’ status and enable us to get the support that will take us to the next level in international competition. Well done Bermuda. A great credit to the country and the sport of swimming. I agree with the comments of Ben Smith. Dedication is essential and the swimmers, sailors, tennis, equestrians, track and field athletes, and others are flying the flag and leading the way. Team sports have become a joke apart from rugby. Time to withdraw financial support from football and cricket and divert it to athletes who show dedication and commitment to their sport and country. At some point we need to move Football and Cricket to the status of our Cultural National Sports and recognize swimming and sailing as our actual national sports – no other sport is reaching this level of success! Amazing performance, especially from Lisa Blackburn. Way to go, Bermuda swimmers! we are so proud of all of you. Congratulations to our swimmers! Truly laudable achievements! I am also glad every time I hear of another program to offer both swimming and sailing to all children. For a long time, sailing especially, was limited primarily to a certain segment of our population. Now that it is available to all who wish to take advantage of the opportunity, I fully agree that, as an island, water sports should become our national sports. It seems all our best footballers are leaving to bring glory to other teams. Although I enjoy football, I haven’t been to a game in years and I would hesitate to take a child because going to a game here means risking a serious contact high (but that’s a topic for another time). Congratulations to all these able-bodied athletes. Meanwhile, Bermuda’s first-ever Paralympian Jessica Lewis continues to maintain first and second place in this season’s Para-Athletes Meets throughout the US, Canada, Switzerland, and France. Well done to them ALL !